Readers, I’m back experimenting in the kitchen again as it’s officially Summer (also known in Glasgow as TAPS AFF) and beer and bbq season. 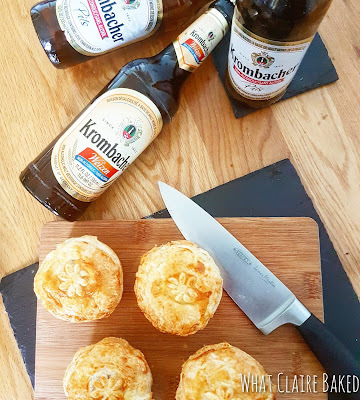 The lovely people at Krombacher were in touch recently, to see if I’d be willing to do some kitchen experiments with their low alcohol beer. This is the first of two planned posts showcasing interesting things you can do with beer as well as drink it. Take note, these recipes have both been made with Krombacher low alcohol products – from the biggest family owned and operated brewery in Europe. You’ll find these beers to be produced according to the Germany Beer Purity Law of 1516. Both the Pils and the wheat beer I’ve worked with here are low alcohol and actually taste like beer. These are great for drinking as well as cooking – various statistics are showing adults are shunning alcohol or attempting to cut down as part of a healthier lifestyle. In Scotland, we have fairly strict drink driving rules, so one of these low alcohol beers at an afternoon barbeque could be an option – especially when you’ve had too many carbonated soft drinks like you're at a a children’s party! 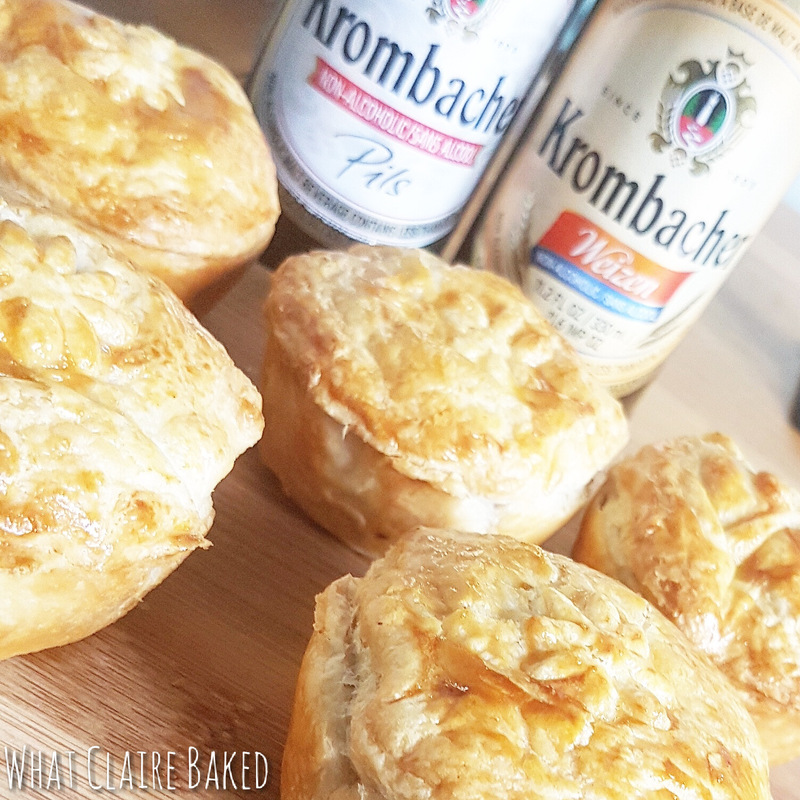 So as well as enjoying these as part of a low alcohol lifestyle, I’ve cooked up a few recipes to share with you all for Summer entertaining season – all perfect snack foods to enjoy with a low alcohol Krombacher or two! Dry off each chicken fillet with a paper towel then season with salt and pepper. Then, coat each fillet in plain flour. In a separate bowl, beat one egg, add in the flour and Krombacher Pils Low Alcohol and mix together until a smooth batter is formed. Then dip each floured fillet into the batter, coating on both sides. Shake off any excess. Transfer to a plate and refrigerate for ½ hour before frying to settle the batter. Next, add the oil to a DEEP heavy based sauce pan and heat the oil to 350F – check using a temperature proof kitchen thermometer. Don’t let it get too hot. Alternatively, if you have a deep fryer, you can cook in there (I don’t have one). Please be careful handling pans of hot oil. It can be dangerous. Once the temperature is reached, aimed to maintain this during cooking. Cook fillets 2-3 at a time, turning throughout cooking. Cook time for breast meat should be 8-10 minutes. Turn during cooking. Remove from pan using a slotted heat proof spoon, then drain on kitchen towel. Cut through one of each to check meat is white and fully cooked. 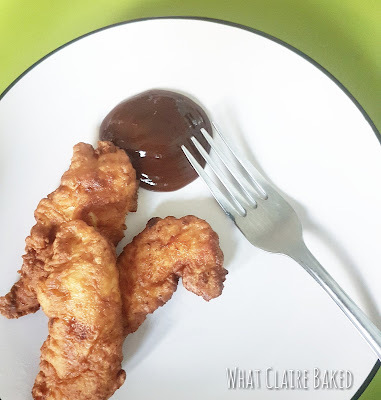 Serve immediately with bbq sauce. Be careful – do not touch the oil and pan until it is fully cooled down and dispose of the oil responsibly. These take a good bit of time to prep but are worth it. You might end up with leftover meat – fear not, it can be frozen and used at a later date. Slice the onion, add to a large heavy based pan and begin to fry and soften before adding the garlic. Toss the meat in plain flour and add to the saucepan, start browning. Add in the remaining dry ingredients and mix, then straight after, add a full bottle of Krombacher Weizen Low Alcohol. Mix together and cook on a medium heat for around 5 minutes. Once starting to boil, transfer to a slow cooker and cook meat on low for around 7 hours. Once your meat is cooked, begin to assemble the pies. Start by greasing a muffin tin and preheat your oven to 180c (fan). Take your pre-rolled pastry and cut out a large circle and a slightly smaller circle for the lid. The large circle should fit in the muffin tin and reach the top on both sides. I used a wide topped cup as my guide and a narrower mug for the lid of the pie. From the two rolls of pastry, prepare 12 large and 12 smaller circles. If desired, you can re-roll the pastry to make more. Place each of the larger circles into the muffin tin to make a case, then spoon in your cooked meat to each to around ¾ full. 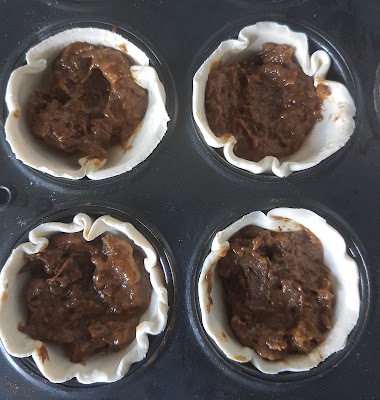 Next, using a damp finger, go around the top of each case and put on the smaller pastry circle – making sure it is well sealed to the case around all edges. Repeat with the remaining mix until all are topped and sealed. Wash each with a pastry brush and beaten egg. Transfer to the oven, bake for around 20 minutes, or until pastry is golden and the meat is hot. Remove from the oven and muffin tin, then serve immediately. Disclaimer – this post has been sponsored by Krombacher beers.